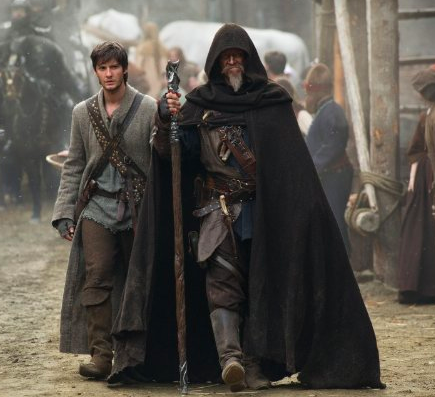 As a seventh son of a seventh son, young “Thomas” (Ben Barnes) is the new apprentice of witch-slayer “Master Gregory” (Jeff Bridges), appointed to replace his now deceased predecessor. Once Thomas' training begins, he faces the added challenge of the coming of the new blood-moon. At such time, “Mother Malkin” (Julianne Moore) — once imprisoned by Gregory — has broken loose to unleash havoc on the world. In the long and winding quest to destroy witches, which even the church seems reluctant to attempt because these witches are too powerful, Thomas meets and falls in love with “Alice” (Alicia Vikander), another witch, putting a conflict of interest between himself, his master, and his destiny. The movie Seventh Son has all of the alluring language and symbolism of a good Dungeons and Dragons quest, but most of this is wasted on canned CGI-imbued action sequences, recurrent physical transformations, and unprincipled enemies or otherwise specter presences floating around. It becomes obvious early on that Bridges is having perhaps the most fun of anyone on screen, but only because his reused accent, taken straight from R.I.P.D. (2013) and True Grit (2010), stuck with audiences and he still has fun playing around with it. Barnes and Vikander we will likely see again, as they offer much more than they had the chance to present to us here. But neither their performances, nor the often relied upon lighthearted humor that the film tries so hard to rely upon do much to make this fantasy adventure more than something that could have ended up as a good made-for-TV event. Moore, as Mother Malkin, is one of the least relatable characters at any juncture. It takes about 70 minutes of viewing to see a significant rise in interest levels. Without leaving a greater impression on audiences, Seventh Son might as well be seventh from the bottom in movies this year.